Limited to 250 signed copies. Tracks recorded at Monkeys in Hamburg on the band’s most recent tour of Germany. 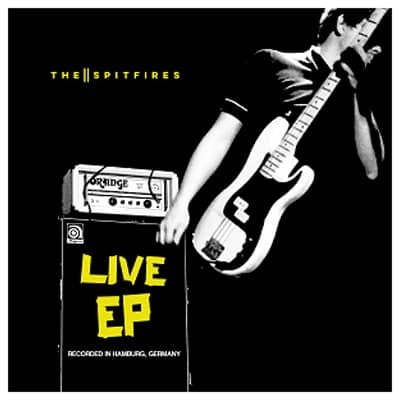 Off the back of their 2018 acclaimed album ‘Year Zero’ and with a relentless touring schedule lined up for the Spring, The Spitfires are about to blend the explosive ruckus that is their live show, with their undeniably authentic rock and roll records. The Watford-based band have plucked 5 tracks from last year’s Hamburg gig to create their first release of 2019, a Live EP. Blending everything from gnarly punk-driven controlled chaos to rock-steady breaks and ska-heavy goodness, the sound of The Spitfires is only identifiable to them and has resulted in a #1 album in the UK Independent Chart, a performance on BBC’s The Andrew Marr Show and countless tour dates across the world. Now they are offering an unmissable collectable, a double 7” vinyl recording of what they do best – playing live in front of packed venue of their beloved fans – who’s in?